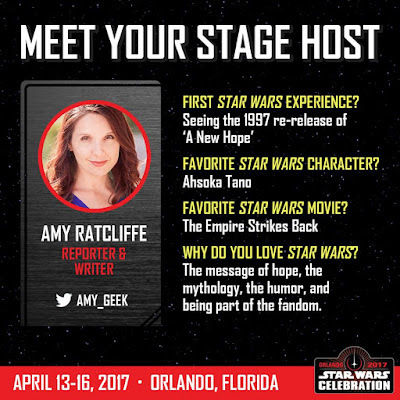 Star Wars Celebration Orlando is nearly here! The ultimate gathering for Star Wars fans is happening from April 13-April 16. 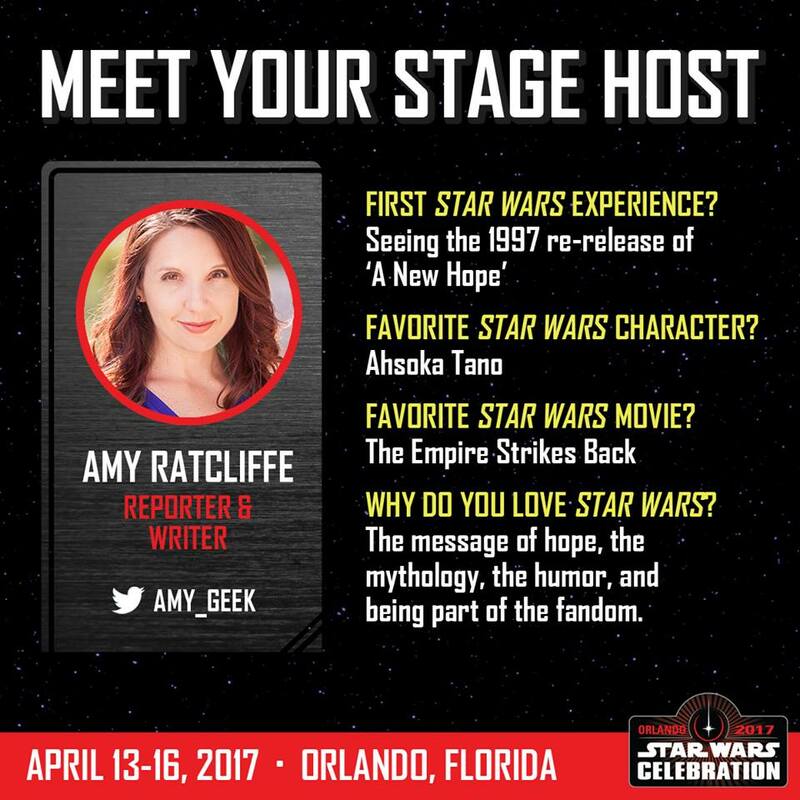 I'll be back as the host of the Behind-the-Scenes Stage and am so, so excited that they asked me to host again because I had a blast at Celebration Europe. I'm looking forward to talking Star Wars with all kinds of awesome people for four days and to seeing my Star Wars fandom family. My Celebration schedule is just below! What does being a stage host mean? It means I host/moderate most of the panels on my stage every day. That's where I'll be most of the convention. Here's the schedule for my stage. LEGO, Disney Parks merchandise, DK Publishing, Doug Chiang -- I have SO many cool panels I can barely stand it. Thursday, April 13 - I'll be at the Drowning in Moonlight: a Memorial Gala in honor of Carrie Fisher, get tickets here. 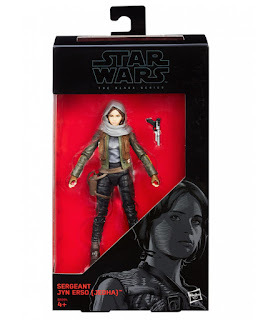 Strong female characters are central to the “Star Wars” universe. From Leia to Padmé, Rey, Jyn, Sabine and Ahsoka - each has become a fan favorite around the globe. Join Dave Filoni, Lucasfilm Story Group's Carrie Beck, Ashley Eckstein ("Ahsoka") and Tiya Sircar ("Sabine") for a talk about the importance of these role models, how they have inspired generations and where we might see them next! 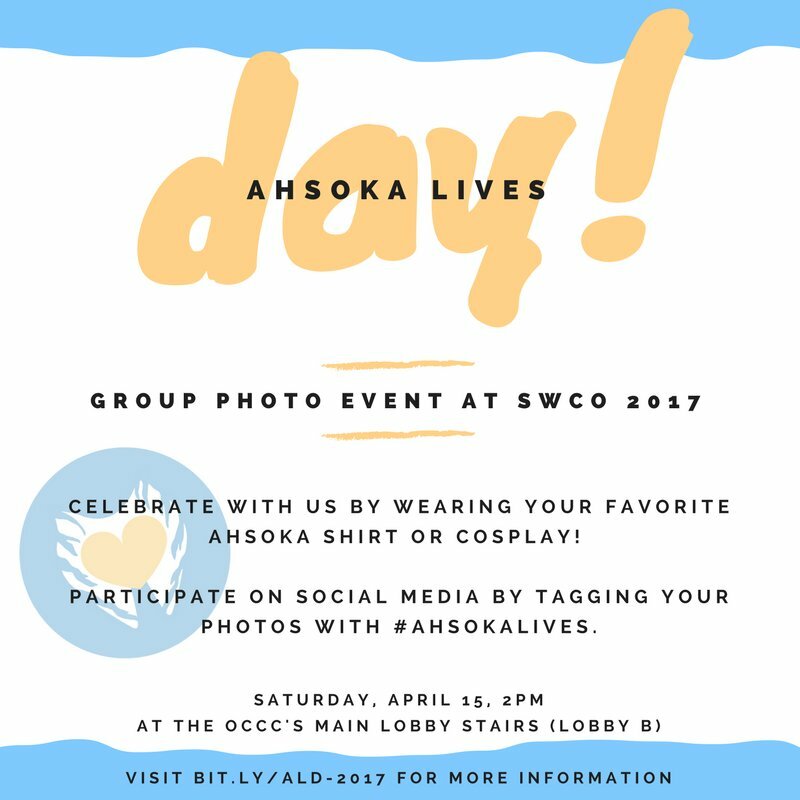 Saturday, April 15 - Put on your favorite Ahsoka gear and come to the Ahsoka Lives Day photo at 2pm. TL;DR: If you want to say hello, the best thing to do is grab me between panels at my stage. If you listen to Lattes with Leia, hit me up for a button! Are you attending Celebration? Come to my stage. I hope we get to say hello. If you can't make it, I'll be posting as much as I can from the event on Twitter and Instagram -- especially Instagram Story! Coming to Star Wars Celebration Orlando? First of all: YAY. 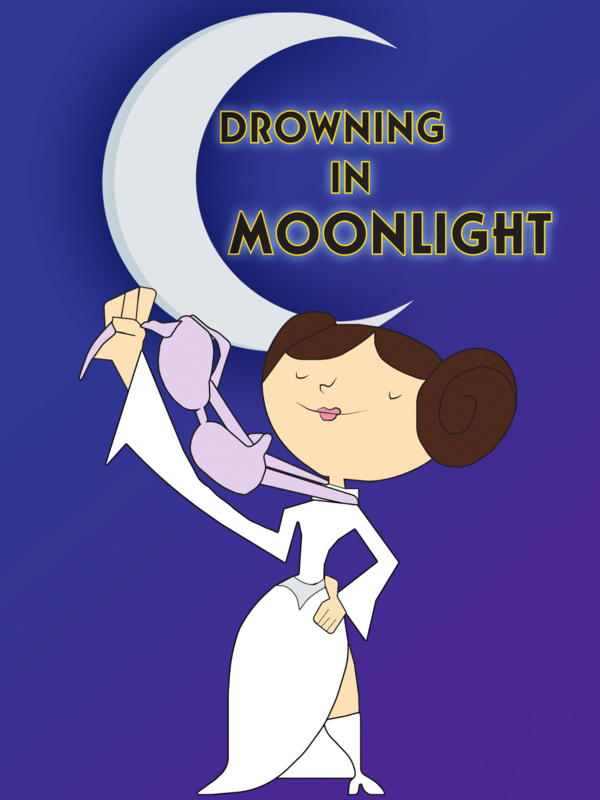 Secondly, if you're free Thursday night of the convention (that's April 13), why not come to Drowning in Moonlight: a Memorial Gala in honor of Carrie Fisher? The ticketed event will feature music and dancing, door prizes, an auction, and more. Proceeds will go to a charity that Fisher worked with, The Midnight Mission. Join us in remembering the awesomeness of Carrie Fisher. You can purchase tickets and get more details here. It's almost time for Star Wars Celebration, and that means it's almost time for Ahsoka Lives Day! When Ahsoka Tano returned to the Star Wars universe in the season 1 finale of Star Wars Rebels, Johnamarie Macias and I decided we wanted to celebrate the occasion at Star Wars Celebration Anaheim in 2015. We held the first Ahsoka Lives Day and shared wonderful warm and fuzzy feelings with Ahsoka fans. We continued the tradition at Celebration Europe in 2016 and are gathering once again at Celebration Orlando in 2017. Join us at 2:00pm on Saturday, April 15, at the Orange County Convention Center for a group photo. 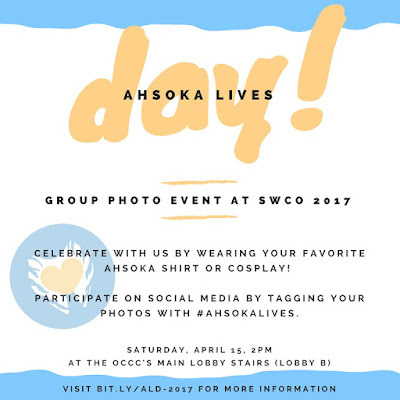 Wear your favorite Ahsoka gear -- a shirt, cosplay, accessories, etc! Partcipate at home with the hashtag #AhsokaLives. I'll try to assemble all the pictures together into a mosaic. Get all the details you need here! I hope to see you there. The American Civil Liberties Union (ACLU) has our backs. They defend our rights and our freedoms, and this happens to be a time when we need that more than ever. They have received large donations recently, but it's going to be a long fight. 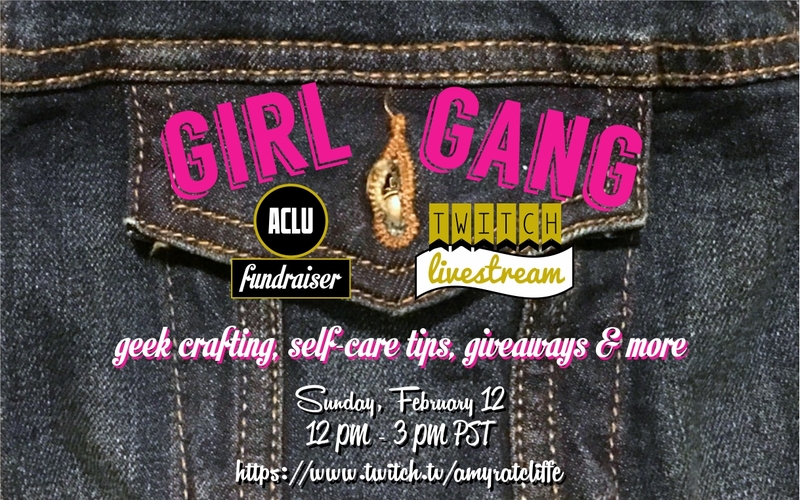 To that end, we're going to do the kind of fundraiser you can only do in this modern age: a Twitch stream! Salt Lake Comic Con Schedule! 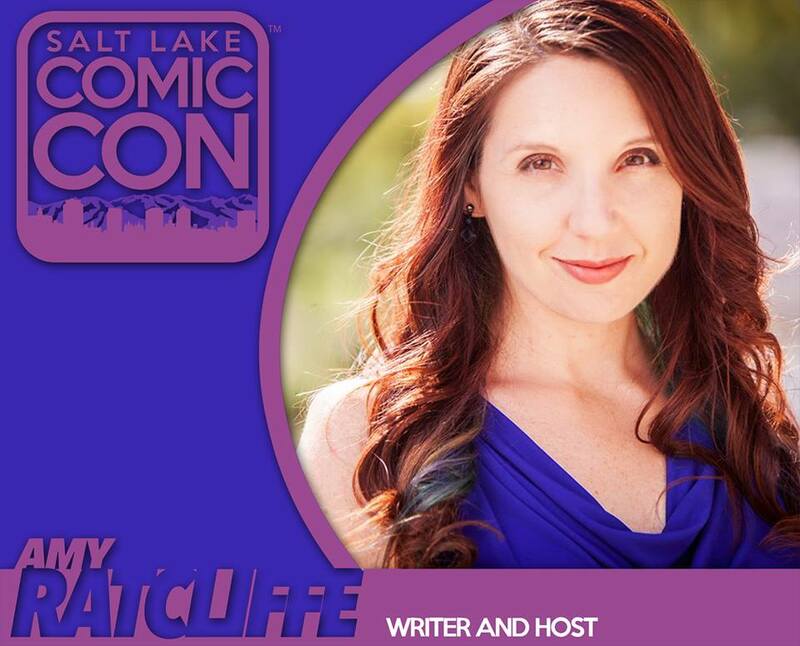 Who will be at Salt Lake Comic Con next weekend? You can't see it, but I'm raising my hand. I'll be a guest at the convention appearing on some panels about Star Wars and Supernatural, moderating a couple panels, and doing a Full of Sith live show. Yay! I'm moderating this panel with Steve Blum, Phil Lamar, James Arnold Taylor, and Fred Tatisciore -- the voices of several characters in Star Wars animated series. Over the years there have been dozens of trailers for Star Wars movies, some better than others. Our panel of experts will offer a chronological view of Star Wars trailers from 1976 to present and offer expert commentary and context. One of the most popular characters in the Star Wars universe has been with us for only 8 years and we've seen a stunning sweep of her life. Our expert panel talks about the life and times of Anakin Skywalker's padawan turned Force wielding Fulcrum and her impact on a galaxy far, far away. I'm interviewing Osric Chau (Supernatural), yay! While Disney theme parks have always included attractions based on Disney films, recent years have seen a surge of new projects which left aside some of the original ideas of the first 50 years--from The Haunted Mansion and Pirates of the Caribbean to Space Mountain and Soarin'--and focused entirely on getting the most out of popular properties like CARS, TOY STORY, STAR WARS, AVATAR and Marvel Comics. What are the pros and cons of such an approach? Are the parks giving the people what they want, or giving the people what Disney knows it can sell? The Clone Wars ran from 2008-2015 and, with more than 100 episodes and a movie, it changed the way we look at the mythology of Star Wars forever. Our panel goes over the biggest things it changed and why it's as important to the mythology as the movies themselves. For the first time ever in Salt Lake City, the Full of Sith podcast brings the full line up of hosts to you to talk about the latest in Star Wars. And be on the lookout for special guests in addition to Amy Ratcliffe, Mike Pilot, and Bryan Young. The mythology of Supernatural is ever expanding, and season eleven is no exception. Join us for an in depth discussion about the angels, demons, monsters, hunters, witches, gods, and of course, the Winchester Brothers, who inhabit this unique television universe that has been going strong for eleven years. This will be a great discussion for writers and content creators who want to delve into the topics of world building and character development, as well as for fans of this favorite show. When you collect toys, or anything really, there comes a day of reckoning when you look at your sprawling collection of plushes, Funko POPs, Hot Toys statues, or whatever and realize you have space problems and/or that the awesomeness of your collection isn't being displayed as it deserves to be. I'm not a person comfortable with items sitting in storage (though I do have toys in storage right now) hidden from daylight and view. If I've gone to the trouble of finding and purchasing a bunch of Tsum Tsum toys, for example, I want to see them and show them off (which I recently did when I found the perfect shelf for my Tsum Tsum stash). So, given all that, I'm trying to work on display solutions in my tiny apartment. My Disney Infinity figures were at the top of the "I need to do something better with these" list. I had them all on shelves on my TV stand. It was fine, but I couldn't see all the figures and they are rather cool sculpts -- I would have purchased them even if I didn't play the game. Aww. Let's pour one out for the canceled game. Online research showed me many Disney Infinity figure collectors used picture ledge shelves from IKEA or baseball bat display cases from Michael's. I considered both options; the appeal of not dusting my figures won out so I went with the display cases. The cases fit anywhere from 14-16 figures. With about 100 Disney Infinity characters, that meant six or so cases, which I decided was too many. Instead of lining up all those display cases, I used the space between them. I still have to dust, but at least I only have to clean half the collection? The basics: I cleaned each figure with a damp paper towel (and sometimes a Q-Tip) and sorted them by franchise and film, I had someone else hang the shelves because it's not something I have patience for, and then carefully placed each figure. I put big ones like Hulk and Iron Man's Hulkbuster armor inside the cases. I was happy to see I still have room for the Finding Nemo and Alice in Wonderland figures, too. I'm going to add LED strips eventually, but for now, I'm pleased. The baseball bat display cases fit 3 3/4" action figures and Funko POPs, and since they're made for heavy bats, I don't think filling them is an issue as long as the cases are properly mounted. Again, you can get them from Michael's. They're $59.99, but they go on sale regularly -- I got mine for $29.99 each. How do you display your Infinity figures? Send me pics! This photo was from 10 weeks ago, and I will not show you how much more full the shelf is now. I have a problem, okay? Okay. 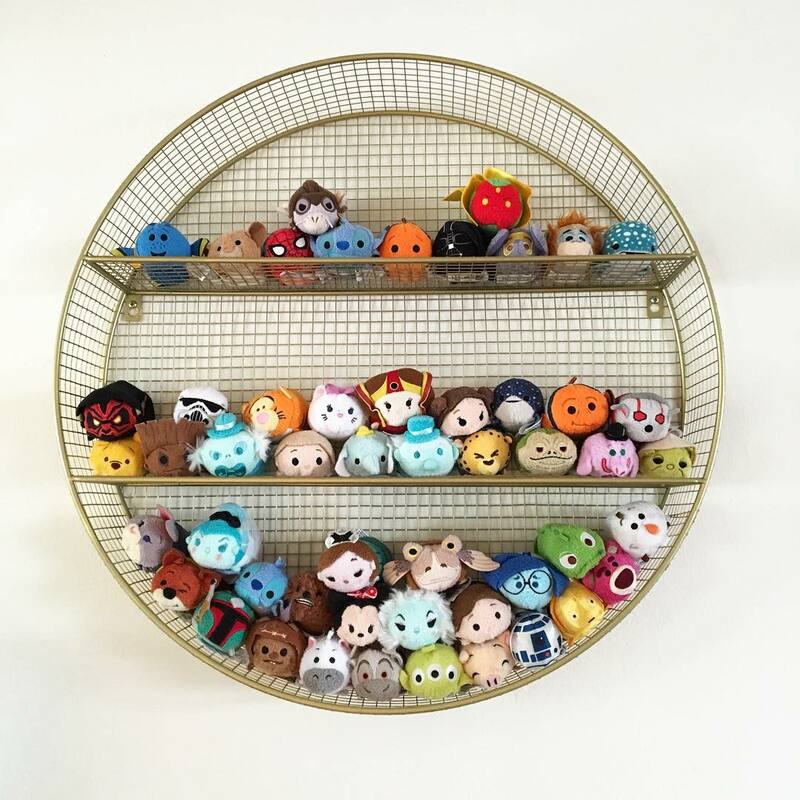 So, in case you also need to organize your Tsum Tsum collection, you can nab the Pillowfort Circle Shelf from Target for $29.99. Feel free to share pics of your Tsum Tsum display with me on Twitter; I would love to see how you show off your collection!